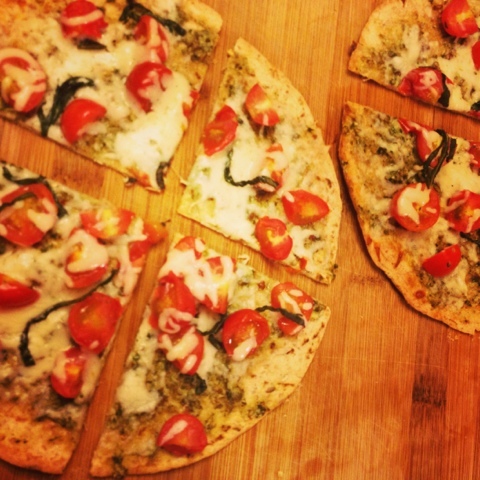 Today we are whipping up Garlic and Basil Pesto Flat Bread Pizzas! Pizza is one of our top ten cravings and we love to turn the typical greasy slice into a healthy and delicious personal size pizza. Isn't it more fun when you can sit down in front of 4 slices instead of one anyway? 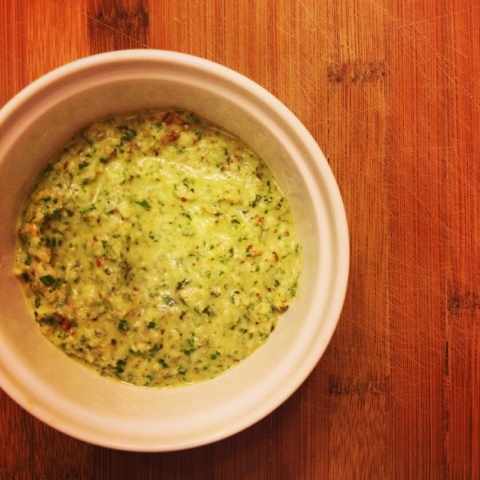 We put a spin on the typical tomato sauce and whipped up a quick and easy garlic and basil pesto. To make the pesto simply blend together basil, garlic, olive oil, nutty parmesan cheese, almonds, and freshly squeezed lemon juice. 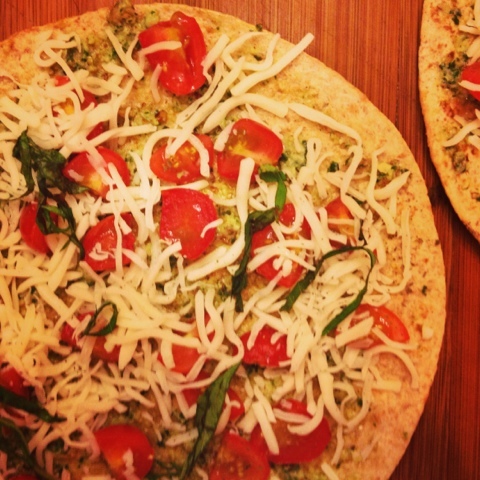 We toasted up whole wheat tortillas and spread on our delicious basil pesto. We topped each pizza with quartered grape tomatoes and two tablespoons of reduced fat mozzarella cheese! I use flatbread a lot with my munchkins. It's a great way to have rosemary style bread or pizza in a pinch. Sometimes there is no time to wait for dough to rise. I keep these on hand at all times! Love your blog. Found you through my sweetie Ashlee over at abpetite. Hope you can check out my link up every Tuesday called, I Declare! Thanks so much Cortne! We will do :) Looking forward to linking up! I love how this doesn't even look skinny! :) can't wait to make this! Thank you so much for linking up with me this week at Tasty Tuesdays! I’ve pinned this & shared it with my followers!